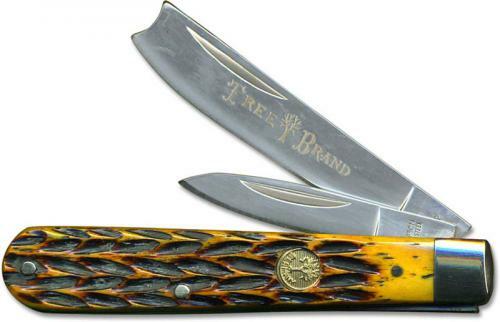 The illustrated Boker Knife is the Boker Razor Jack Knife that features razor and pen blades made of high carbon stainless steel with nail nicks for opening. The jigged brown bone handle of this Boker Knife, 3 1/8" closed, has brass liners, round Tree shield and a single polished nickel silver bolster. The Boker Razor Jack Knife with jigged brown bone handle is assembled in Germany.